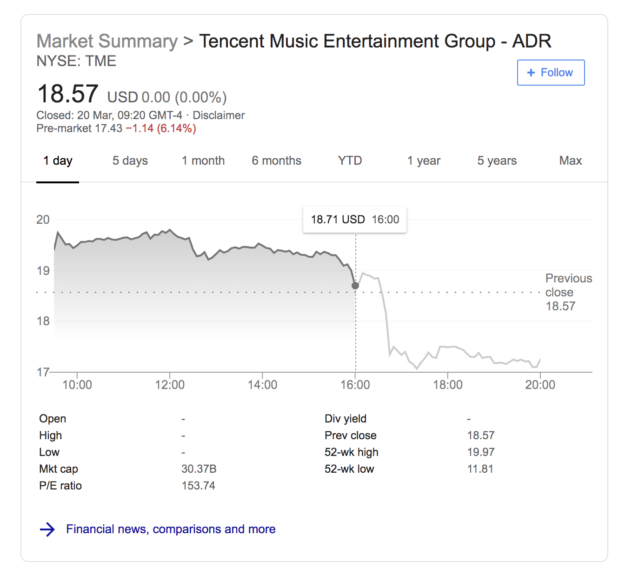 China-based music streaming service Tencent Music Entertainment (TME) has published its full year and Q4 earnings for 2018 – its first earnings report since its IPO on the New York Stock Exchange on December 12. The company posted a net loss of RMB 876m ($127m) however, which it says is owed “to a one-off” RMB 1.52bn ($221m) accounting charge related to equity issued to its major label partners Warner Music Group and Sony Music Entertainment. Tencent has also reported a staggering 644m online music mobile MAUs (monthly active users), a 6.8% increase on the 603m reported at the same time in 2017. This figure, says TME, is the sum of mobile MAUs of all Tencent-owned music services, namely QQ Music, Kugou Music, and Kuwo Music – adding the disclaimer that “duplicate access of different services by the same device is not eliminated from the calculation”. Of that 644m, the number of users paying for TME’s online music services increased by 39.2% to 27m. Tencent has also reported 228m Mobile MAUs of its social entertainment services (karaoke and live streaming), up 9.1% with 10.2m of those being paid users – in other words, users who have paid at least once for social entertainment services through purchases of virtual gifts or premium memberships. The mixed results, including the soaring expenses and net loss in Q4 have clearly worried Wall Street – with TME shares (at the time of writing) dipping below $17 this morning (March 20), having closed at $18.57 yesterday (March 19) and falling over 7% in overnight trading. 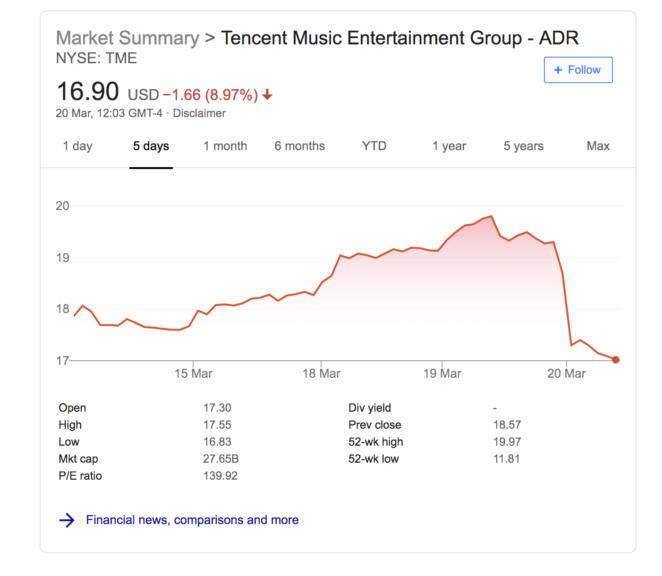 Last month Reuters reported that TME owner, Chinese media giant Tencent is mulling an acquisition bid for Universal Music Group. Cussion Kar Shun Pang, Chief Executive Officer of Tencent Music said: “Our initial public offering in December 2018 has launched us onto the international stage, elevated the global recognition towards our brand, and endorsed our successful track record. “During the fourth quarter of 2018, we recorded strong growth across our business lines, including both online music and social entertainment services, and solidified our market leadership. “To fuel our growth for the years to come, we are firmly committed to continue investing in premium content offering, innovative products and proprietary technology. Going into 2019, we will continue executing relentlessly our mission to use technology to elevate the role of music in people’s lives. Mr. Cheuk Tung Tony Yip, Chief Strategy Officer of Tencent Music added: “We are pleased to report that both online music and social entertainment services have continued their healthy growth across the board during the fourth quarter of 2018. Shirley Min Hu, Chief Financial Officer of Tencent Music said: “We delivered strong revenue growth during the fourth quarter of 2018 driven by the increase in paying users across our online music and social entertainment services as well as the increase in user spending in social entertainment.